Salam & hello everyone! 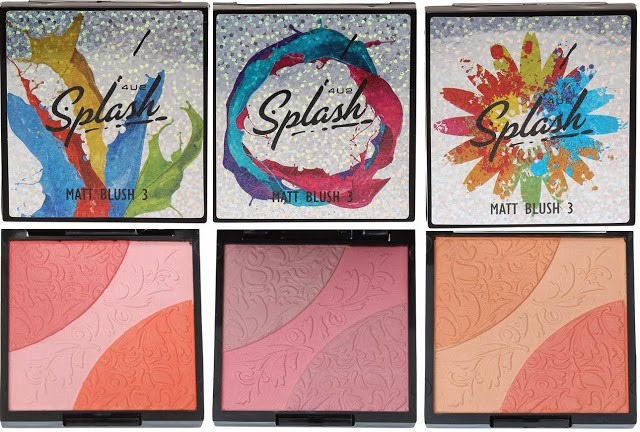 As promise, after reviewing the 4u2 Splash eye shadow quad which you can read it here (link), I will be reviewing the blush next. So here is the blush that I have tried a few days ago and here is my thought. The shade that I have tried is in number #2. Which is the first one on the left on above picture. As you can see the blush is actually embossed with a lace pattern on it. You can really see in my really picture because I have used it and swatch it quite frequently leaving the lace embossed on the blush gone. Ganas betul. Again, as you can see they have 3 different shade in one blush. On the swatch picture above, the first one from the left is a combination swatch of all three color. It looks pretty bright peach color which the other 3 individual color swatch are (from left to right) a semi bright raspberry tone color, soft pink tone blush color and a bright peach tone blush color. It smells like baby powder! And they are matte blushes and there is no hint of shimmer in it. Application wise, they are pretty smooth and pigmented but they only last a few 1-2 hours. Re-application is needed. Use a blush brush and they are really picked up with it. Again as I mention in my last post about the eyeshadow, I don't really like the packaging as they look pretty tacky, but for quality, they are a pretty good blush! Love the color combination! Do you love matte blush or sparkly ones? Totally reminds me of Étude House Minnie Blusher. Though instead of floral embossed, it's Minnie Mouse. I do love the one that you got. I think between the three, this one could go with my skin colour. But I have to agree that the packaging is a bit tacky, but the matte finish is perfect for my everyday look, I guess. Mom got me Mary Kay Blushers early this year and I love/hate the shimmery looks. Love it when I go out with girls, but I don't think it's quite suitable for everyday look. The colours are very cute but I think they're too matte for me. yep, they are all so cute! yep! like 4 colors in one blush! welcome Amanda! yep! peach tone is always gorgeous!